The Brew Crew Series is the place where Bad Shepherd's non-brewing staff get to play around in the brewery. And, for beer number four in the series, the baton was passed to chef Jen. 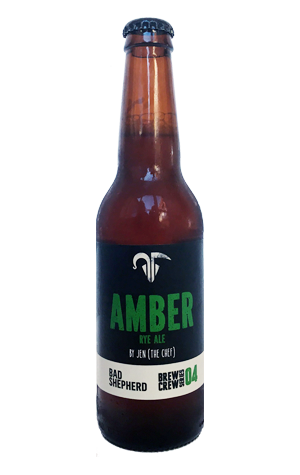 When pairing beer with food, you're generally going to find more room to manoeuvre with malt or yeast driven beers than anything loaded up with hop bitterness and here Jen has plumped for the former in creating an amber ale enlivened with a dose of spicy rye. The tasting notes say it's "loosely" based on an American amber ale; we'd suggest it's so loose the boat has slipped its anchor and drifted all the way to the shores of Blighty. The beer, brewed entirely with English and German malt and European hops, brings to mind a hearty English ale more than anything, with the rye contributing to a full body and with the spice it contributes flowing into the spicy, earthy hop bitterness. Pair, presumably, with something from their in-house smoker.